Mayonnaise is the secret to making these Creamy Dairy-Free Mashed Potatoes just as good as their dairy-containing counterparts. Yup, you DID read that correctly. It IS possible to make CREAMY dairy-free mashed potatoes. And without a dairy substitute! Nooooooooooo, I haven’t lost my mind. It’s true. I promise. Weeeell, it all started after Greg was diagnosed with IBS. He realized that certain types of dairy products cause gastrointestinal symptoms for him when eaten in large quantities or multiple times a day. 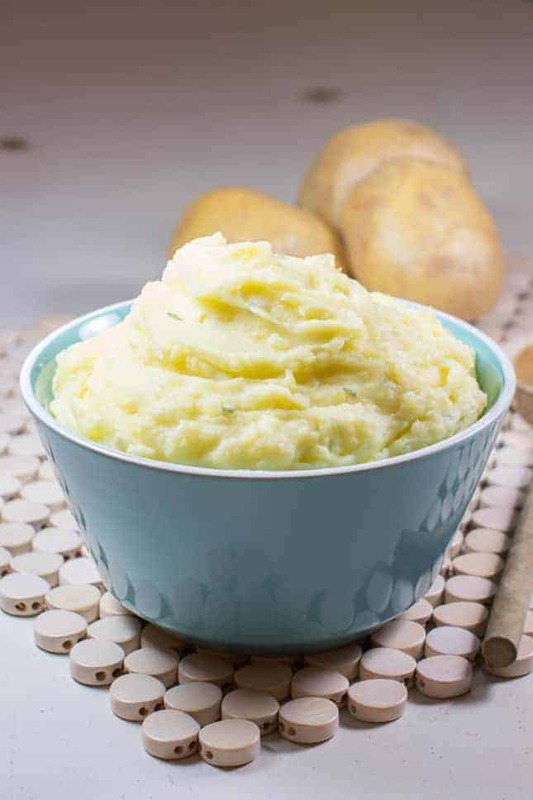 So, I made it my mission to create a truly dairy free mashed potato recipe that was just as delicious as our favorite milk-laden mashed potato dishes of the past. Then I dared myself to make these mashed potatoes WITHOUT using a dairy substitute, such as a dairy-free milk or dairy-free butter. The first ingredient I decided to use was chicken broth. I remembered watching commercials around Thanksgiving time that advertised making mashed potatoes with chicken broth. So I headed to the pantry and check! We have broth! I got to work. I added my usual seasonings and the chicken broth. Then I mashed. Not creamy enough. So I added more broth. Still not creamy enough. So I did and boy was I pleasantly surprised! Absolute perfection! Creamy dairy-free mashed potatoes have been achieved. Mission complete. 8/24/17 – UPDATE: Please note that we have added a vegan option based on reader feedback. Then cube the potatoes so they are uniform in size. Next, boil the potatoes until fork tender. Then drain and return to pot. Add chicken broth (or vegetable broth for vegan option) and mix with a hand mixer. Stir in mayonnaise (or vegan mayonnaise for vegan option), parsley, white pepper and salt and continue to mix with the hand mixer until all ingredients are evenly combined. Take a big scoop and enjoy! Place potatoes in a large pot and cover with one inch of cold water. Bring to a boil and then reduce heat to maintain a steady rolling boil. Cook until potatoes are fork tender (approximately 15-20 minutes). Be careful not to overcook or the potatoes will become too starchy. Drain potatoes in a colander and return to pot. Add broth and mix using a hand mixer. Stir in mayonnaise, parsley, white pepper and salt until you've achieved desired consistency and flavor. Mix again with the hand mixer until all ingredients are well combined and lumps are removed. Be sure not to overmix or the consistency of the potatoes will become too gluey. *Nutrition Facts were calculated using 1/3 cup regular mayonnaise and low-sodium chicken broth. Please note "salt to taste" was not included in the calculation. I tried the vegan version for Thanksgiving and it was such a hit with even my non-vegan relatives! I just substituted with vegetable broth and a vegan mayo.